What is the perception of racism in New Zealand? The aim of this research would see a better understanding of what New Zealander’s perceive racism to be and whether ethnicity and length of time spent living in New Zealand effects this perception. The methodology specified in the research proposal was to have participants take part in a survey, where racist jokes were presented and asked to be ranked on a scale from 1 – 4 (1 being the lowest perception of racism). 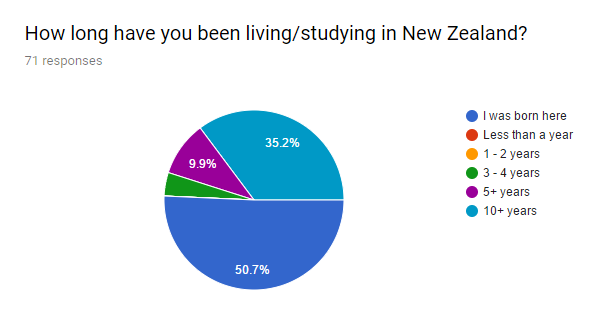 It was also asked of the participants to state their ethnicities, whether they identified to a certain ethnicity more so (if they belonged to multiple) and how long they have been studying/living in New Zealand. The scale had been altered to be ranked from 1 – 5, providing participants the rank of 3 which was neutral. The rank had been labelled as 1 being ‘Highly offensive (not funny)’ and 5 being ‘Not offensive (very funny)’. The aim was to have 100 participants to have a fair sample/representation of the multicultural population of New Zealand. It was also stated that the participants would be students from Colab. Realistically the goal of 100 participants could not be reached in the timeframe given and if participants were only to be students of Colab. Thus an online survey was created, as it was efficient in reaching a wider audience (shared via. Facebook) and participants could complete the survey in their own time and in a comfortable environment of their choice. The goal of 100 participants was lowered to a more realistic number of 60 – a total of 71 responses were recorded. From previous research based in the US, it is speculated that a participant is more likely to perceive a high level of racism, if the racist action is degrading their own ethnicity. An additional question was asked to scope how long the participant has been living in New Zealand for. I theorised that living and immersing one’s self in the multicultural environment of New Zealand, would result in having greater empathy towards other ethnicities that they do not belong to (i.e. they have a friend who is that ethnicity). Selection of those ethnicities were done so that each group had a joke that targeted a majority ethnicity within the group (eg. Chinese for the Asian group) and a minority group. Another important factor that impacted the selection was being able to find a racist joke of the certain ethnicity. From the 71 responses, it was evident that the common answer chosen for all 11 questions was ‘1 – Highly offensive (not funny)’; other answers varied in rank per racist joke. Throughout the process it was apparent that there were a lot of flaws in this study, nonetheless it received mixed reactions from participants, ranging from “Is this survey for real?” to “I am curious as to what results you will receive.” Only at the end would it seem that this study is only the first step towards answering the broad research question. The irony of this is that these surveys only acknowledge majority ethnicity groups, and group minority ethnicities as ‘Other’. By opting for freedom of typing, minority ethnicity groups like Tuvaluan, Kiribati and Thai - that would normally be grouped as ‘Pacific Islander’ or ‘Southeast Asian’ - were realised in this study. On the other hand, I received generic answers such as ‘Other European’, ‘European’ which contrasted from specific answers like ‘Scottish’ – which led me to question whether if it was appropriate to just group them as ‘European’. Undoubtedly, improving the answering method this question is needed in future. It is apparent through this study that the highest ranking answer for each joke, was that participants found the joke to be ‘1 – highly offensive (not funny). It is worth mentioning that 0% of participants have been living in New Zealand for 1 – 2 years. Also the majority of participants were born in New Zealand (50.7%) and the second most, having lived in New Zealand for 10+ years (35.2%). In a sense, I cannot totally rule out the previous theory as (having shared the survey on Facebook) I received such comments along the lines of “I’m not even ___ but I still found that joke offensive” or “I’m __ but I still found the __ joke relatable”. It was initially speculated that a participant is more likely to perceive a high level of racism, if the racist action is degrading their own ethnicity. This speculation was met with differing results. Around half of the responses recorded, expressed jokes that degraded their own ethnicity to have a high-level offence, yet the other half expressed jokes degrading their own ethnicity to be of no offence. Perchance, it could’ve been due to the nature of the survey, consisting of jokes that are meant to be harmless and offer a laugh, thus participants brushed off the offence as ‘just a joke’. Singham, M. (2006). Multiculturalism in New Zealand–the need for a new paradigm. Aotearoa Ethnic Network Journal, 1(1), 33-37.